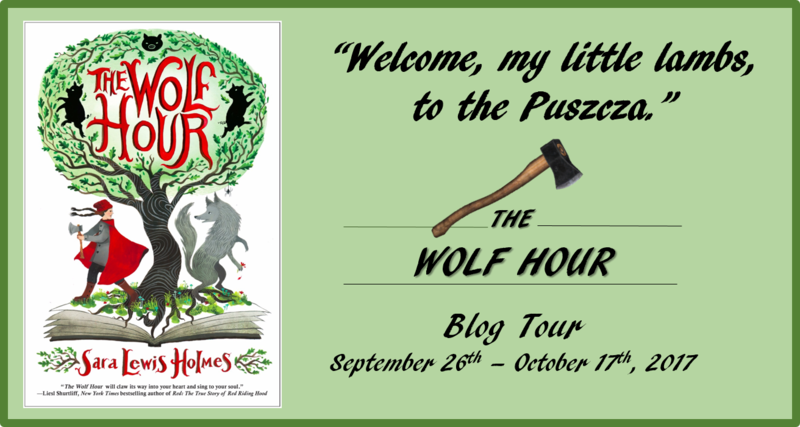 This post is part of the Wolf Hour blog tour, organized by Tanita S. Davis over at Finding Wonderland. You can check out Tanita’s interview with Sara Lewis Holmes and Charlotte’s review and interview now, and keep an eye out for the other posts during October! So take care, little lambs, if you step into these woods. For in the Puszcza, it is always as dark as the hour between night and dawn — the time old folk call the Wolf Hour. If you lose your way here, you will be lost forever, your Story no longer your own. You can bet your bones. The Wolf Hour is a fascinating and odd book, although I don’t mean odd in a negative sense here. I often don’t enjoy fairy tale mashups (as opposed to fairy tale retellings, which I do often love) but Holmes has woven in some of the things I like best about fairy tales: the strange logic, the sense of foreboding, the vivid imagery. So, despite the fact that this story contains strands of several different fairy tales, it feels more like one complete in itself. Set in a small Polish town, outside the great forest called the puszcza, The Wolf Hour is the story of Magia the woodcutter’s daughter, who longs to be her father’s apprentice and help her family survive. It is the story of three pigs. It is the story of a wolf named Martin. But it is also the story of a woman named Miss Grand, and of Magia’s family. In this book, Story is a powerful force, and one that is not entirely benign. Once you’re part of a Story, you’re in it for better or worse. One of the things I liked about this book was how complicated the characters felt. Although fairy tales can sometimes feel simplistic, here Lewis doesn’t allow any of her characters to simply be good or bad. At first, we encounter them more as types than as people, but gradually they are shaded in and become much more complex. This included a revelation that I found personally a bit shocking and even upsetting; I wonder if a kid reader would find it more or less so. From Miss Grand to Magia herself, we see almost everyone in this book in shades of grey. I did personally find that the pacing was a bit odd, since the story jumps ahead by several years at one point. But overall, I felt this one was very successful at recreating the feeling of a fairy tale, with fresh themes and approaches. Magia seems very alone for much of the story, without anyone to guide or mentor her. And yet, by the end the place she has found for herself feels earned and right. She and the other characters are caught in someone else’s story for a time, and they have to find their own ways out. I think this one will resonate with confident readers, especially those who are ready for some fraught plotting and moral complexity. I think the weirdy logic is my favorite thing about Fairytales, too. There’s just this sense of inevitability, as you sigh, “Right, right, of course. That HAD to happen.” It in nowise makes sense in the real world, and you can buck against that inevitability, and that’s what makes real life such a relief! I enjoyed this book for the fact that Miss Grande, awful as she is, also tells the truth. Young readers will have to figure out what to do with that! Ooh, this sounds wonderful! Onto the TBR it goes. I couldn’t remember why Sara Lewis Holmes sounded familiar, but it turns out I really liked her book Letters from Rapunzel. And the premise for Wolf Hour sounds great!